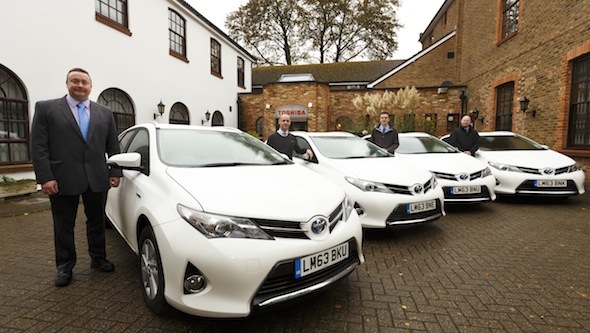 Staff at Toshiba in Chertsey, Surrey with some of their new fleet of Toyota Auris hybrid estate cars. PRESS ASSOCIATION Photo. Picture date: Monday November 11, 2013. Left to right: The users of the vehicles. Andy Adderley, Field Service Manager, Martin Stephenson, Tec Support, Stuart Davison, Sales Support and Steve Coles, Field Service Engineer. Photo credit should read: Chris Ison/PA Wire.